First day back on the golf course for 2010. What a beautiful day my buddy Ed and I had for hitting that little white ball around. We were the first ones at the clubhouse at Deme Acres in Petersburg this morning. Maybe that’s because there was still frost on the roofs and ground, but we were able to get off anyway. We had a new cart, I had a new driver, and the balls were somewhat cooperative. I pared the very first hole, but then had a string of boogies to end up with a 42 on the back nine. You start on the back at Deme. 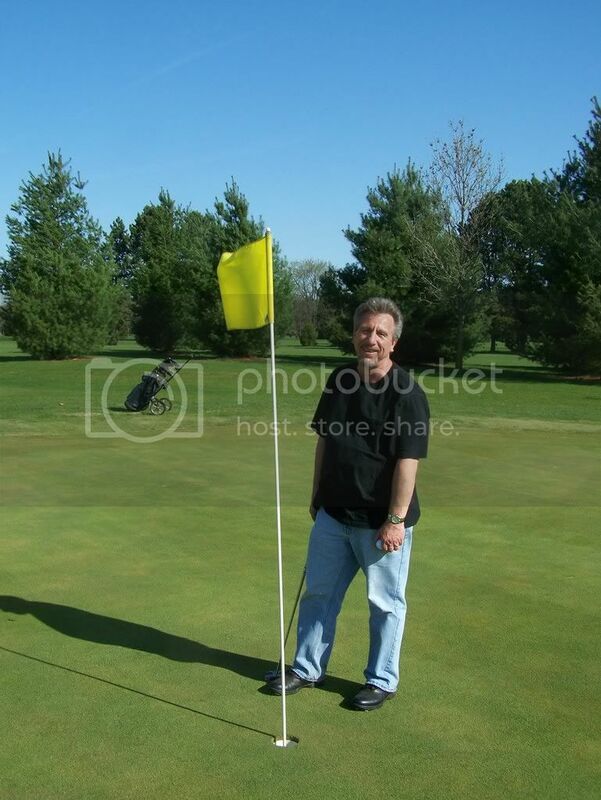 Ed had a 38 and was already in mid-season form. Not to much rust there. Shot a 44 on the front, which is a little harder, and longer than the back nine. Ed had a 43 to end up with a very decent 81. Not bad after a long winters nap. I was a little inconsistent with my new driver, but when I did connect the ball seemed to go further than last year. On the way out to the course we saw two huge rooster pheasants and one hen. I tried to get a snapshot, but they wouldn’t hold still long enough. We also heard several cackle while on the course. Also saw muskrats, geese, and ducks, which is a nice bonus to our golf game. Looking forward to doing it again. I hold in my hand the completed book “Joe’s Story” after almost two years of work. I don’t mean work in a bad way, but in a good, fulfilling, loving way. It was an honor and privilege for me to be chosen to write “Joe’s Story.” Joe had asked me himself about two years ago to start chronicling his stories, so that they could eventually be put into a book about his life. What a life it was! There are pictures from the past, Joe’s military service, and plenty from the boxing years. I am pleased with the way it turned out, and think Staples did a good job on the cover and the binding of the book. I used a very good quality of off white paper which should stand up to the test of time. I loved doing this in honor of my friend Joe. I just wish he could of seen the finished work. I’m sure he would like it, but then again he probably knows all about it. I had 70 copies printed and already I’m preparing to have more made up. If anyone would like a copy give me a call at 734-915-9496 (cell phone) and I’ll get you one ordered. Looks like were back in the camping business. 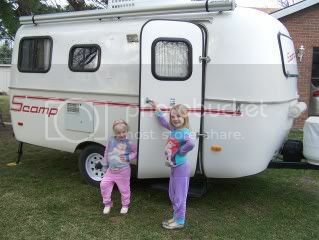 I picked up our little 16 foot Scamp a couple days ago, and you can see my grand -daughters are sure happy about it. They already picked out which bunk bed is there’s, and they can’t wait to go camping with Grandma and Papa. It’s a 4-sleeper, but we could squeeze 5 in if we had to. It has a small toilet along with a shower, air conditioning, and a nice awning. We haven’t been camping for about 30 years, so were going to have to get acclimated to it again. We are going to start off close to home, but someday I wouldn’t mind taking a trip to Alaska. My wife will have to be retired, and I’ll have to still be able to walk on my own. We basically hope to spend some good outdoors time with our 10 grand-kids. Of course it should come in handy during deer hunting season also. It can be pulled with my 6-cylinder Explorer, as it only weighs 1750 pounds. We are all looking forward to our first adventure with our Scamp. 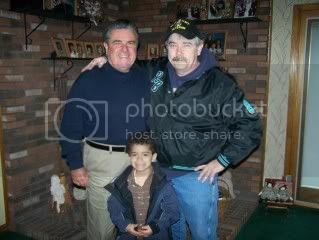 This is a picture of John Hess who used to box for my friend Joe Giarmo. John moved from Monroe many years ago, but would still keep in contact with his boxing coach. He’s living in California now, but happened to be home for his sisters funeral. 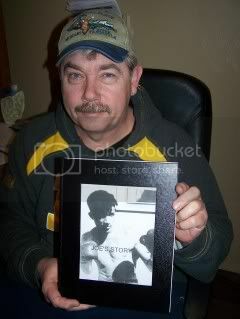 I caught up with him at another sisters place, as he had brought some old boxing pictures with him. I’m winding up my book about Joe, and seeing John was a last minute (icing on the cake) sort of thing. We talked and reminisced about the good old days, along with his sister, as they read exerts from my book. Once I left John I came back to my favorite spot (computer) and made the necessary changes and additions, and it was off to the printers. I felt like I didn’t want to leave my transcript in someone else’ s hands, and prayed they would treat it with care and respect. When I got back home I breathed a sigh of relief, as I blankly stared at the computer screen. I started opening neglected e-mails, and happened to glance at my copier. Horror of horrors! There laid the story about John Hess, that I had pulled from the manuscript to correct one small error. I called Staples and asked if my story had been sent out yet, and they said it wouldn’t be picked up for half hour yet. I told her my problem, and she said she would go get it and have it ready when I got there. Whew! Now I can relax, sort of. Getting back to John. He had a record of 73 wins and only 3 losses during his stellar amateur career. Joe rated John as one of the best (if not the best) boxer he ever coached. 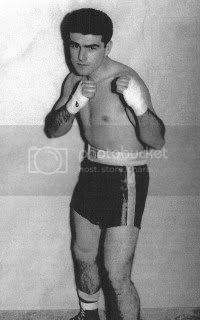 John boxed for the Army while serving a two year stint, and had 38 straight wins and held two light middle weight titles. In 1957 John won the Detroit Golden Gloves Championship along with the tournaments “most promising fighter” award. Joe took 8 fighters with him to the G.G. and the team ended up taking the team trophy. There were clubs present with 40-50 boxers, and Joe’s boys took it to them. His 1957-58 team may have been the best group of boxers to ever come out of Michigan. Wayman Gray turned Professional and four of the other boys were hounded by fight promoters. John was sought out by Gene Fulmer’s camp, but decided on a business career instead. Looks like he made the right choice, as he retired after 37 years with Household Finance, as Senior Vice President. He now owns his own financial consulting business, and said the life lessons he learned from coach Joe Giarmo had much to do with his success. Time marches on. It stops for no one, and once spent, is gone forever. As you (I) get older time seems to creep up on you with all the stealth of a “night-stalker!” It’s all of a sudden like, “How did I arrive here (at this moment in time) so fast?” It seems like yesterday I couldn’t wait to be 13, so I would be a teenager. Then the big deal was 16, and next came 21. It took forever to reach those milestones in my life, or so it seemed. Marriage, children, school and sports, vacation fun, and just enjoying being a parent. At least most of the time! Those “middle years” are probably the ones that went the fastest. Those years when we were going to one school event, or church program, after another. With six kids it was a whirlwind of activity. Barely time to catch your breath. It was exhilarating to say the least. Next thing you know their leaving the nest, and finding lives of their own. Grand kids start appearing on the scene, and retirement looms just around the corner. Some guys look forward to it (I did) and some dread it. I have been retired nine (9) years now, after working as a pipefitter for Ford Motor Co. for 37 years. Those years seem like “life” threw the anchor out, and it was like I was stuck in the current! Not moving, going nowhere; then all of a sudden “Whoosh” the ride is over. Come ashore, get off, move on to the next phase please. 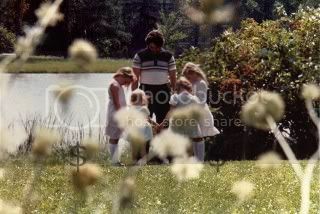 The picture at the top of the page is of me, and four of my five daughters and one son. Between them they have ten children and some are fast approaching that dreaded 40 mark themselves. Those days are like a blur. Two of my kids have been out of the house longer than they were in it! Do I have regrets? You betcha! It would be hard not to, but awareness of the fleeting opportunities we have, as parents, to get it right could minimize those regrets in the future. As I write I think about Art, Tom, Cory and all the other young families just starting off in life. These are trying days for this country and for the world. If ever we needed to redeem (make it work for us) the time, it is now. Enjoy the ride you guys, but don’t think at some point the merry go round won’t stop, and you’ll be asked to get off. Each of us has been given a certain set amount of time by our Creator. We don’t know how long of a ride our ticket bought, but no-matter what it is, please get your moneys worth. Live life to the fullest, embrace it, and remember each day is given to you as a gift, so use it wisely. You might have to use a magnifying glass to see the beautiful rooster pheasant in this picture. Just about every evening he feeds along a patch of weeds across the street from my daughters house. You would think I could get a better picture than this, but he’s a little camera shy. Every time I try to get close, off into the weeds he goes. I have not pheasant hunted in many years. 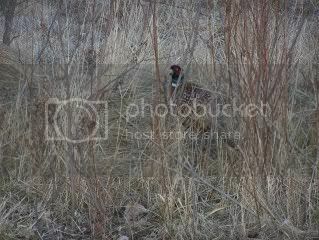 For one thing it is almost a rarity to see one anymore, and if your serious about it, you need a good bird dog. We had the best when I was growing up. She was a spaniel/setter mix, and that dog was born to hunt. When you get one as good as old “Flopsy” you get spoiled on ever having another dog. That is, at least another dog that measures up! We have a pheasant preserve in Monroe, but I just can’t get into pen raised birds. There was a day (before farmers started strip farming) that you could take a drive and see plenty of birds. I once stopped my car and watched nine roosters fighting with one another. They put on quite a show, and didn’t seem to mind me watching. Sure not like that anymore! I’m content just to see one, and try to get a snapshot if I can. Can’t wait for those fields to be green instead of white. Temps. have been in the high 40’s and low 50’s, so it should only be a few more days, and I’ll get my wish. I can hear those turkeys calling me now! “He’s able to leap tall buildings with a single bound!” “look! up in the sky. It’s a bird, it’s a plane, no it’s super boy, Logan Horwitz! I tell you my grandson has more gazoopa’s than his grandpa does! He was actually jumping up and down on this, less than safe looking platform. My wife recently returned from visiting our daughter Meghan, her husband Mark, and grandson Logan in Chicago. 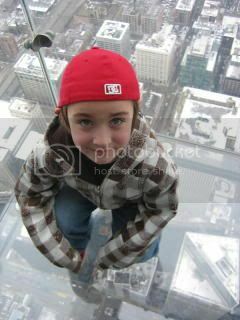 While downtown they took a little 103 story elevator ride to the top of the Sears Tower. Once at the highest point you can then go walk on a see through observation deck. Your actually looking down on the smaller skyscrapers. (Only 50-60 stories) My wife said the cars and buses looked like ants crawling around. Thanks, but no thanks. I’ll stay in the lobby and eat a Chicago style hot-dog! You might be surprised at all the “meat” eaters roaming the snow covered woods during the winter months. In this picture you see a hawk defending it’s claim from a crow. 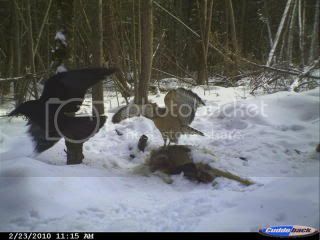 This particular deer carcass was feeding coyote, bobcat, weasel, opossum, and an assortment of winged creatures. There were probably other animals gnawing on the deer, but I couldn’t tell for sure, due to the amount of tracks in the area. The harsh reality of survival in the wilds, is that death often multiplies life for others. 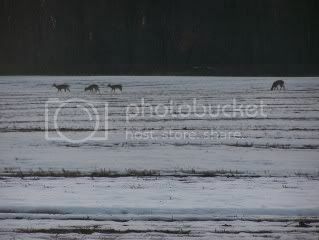 One winter killed deer ends up keeping many other woodland creatures going for the winter. When the snow is deep and the wind is howling any carcass in a storm will do! It has been a long boring winter, at least as far as hunting goes. I only made it out a couple times to try and outsmart a “yote” or out fox a fox, and that didn’t happen. Twice the weather (wind & heavy snow) did my pop-up blind in, and I ended up using duct tape to hold one of the poles together. Well in two months to the day, that is all going to change! Turkey season opens here in Michigan in mid April. I bought an over the counter tag for the third season which starts May third. This year I’m going to try something new. (At least for me) I will be hunting with a guide, who has access to hundreds of acres of Southern Michigan farmland. I want to film the hunt, and for the fist two days will be hunting with my bow from a pop-up blind. Britt Owen will be my guide who runs “Bolt turkey guide service.” I checked out several guides, and was really impressed with the way Britt runs his operation. Not only that their success last year was quite impressive. 16 Hunters took 13 birds last year, and 12 of those were longbeards. Britt is an excellent caller, and I’m no slouch myself. I feel confident if we get in an area with any Tom’s I will get my bird. I am getting excited! 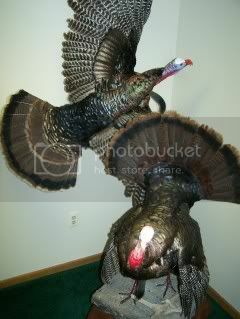 The flying bird in the picture is the one I got last year, and the one strutting, I got several years ago. Check out the different colors in the tail feather plumage. The one strutting has, what I call normal coloration, while the other has several bands of gold in its tail fan. It also just seems to have more color throughout it’s plumage. A very pretty bird indeed. I’ve taken three birds that have had 11 inch beards, but never taken a coveted 12 incher. They are out there, cause I’ve seen em. Maybe this is the year. If your interested in a guided turkey hunt this spring or for next year contact boltoutfitters@gmail.com or call 517-425-2666. See ya in the turkey woods-gobble, gobble!